« How Do Entrepreneurs Operate in Afghanistan? The economy remains very weak. Unemployment, for example, is still almost 10%, and the underemployment rate is close to 17%. Key inflation measures are exceptionally low. The core consumer price index (CPI), for example, is up only 0.6% over the past year. It’s unlikely that Congress and the White House will do anything to stimulate the economy. In short, the economy is struggling, inflation appears tame, and the Fed is the only game in (Washington) town. Items (1) and (3) are, I suspect, not controversial. Moderate economic growth is moving us in the right direction, but has done little to create jobs or reduce the yawning output gap. And given the Republican’s election gains, it’s hard to imagine a new round of fiscal stimulus (except an extension of the expiring tax cuts — a form of anti-anti-stimulus). Item (2), however, is highly controversial. Some commentators argue, for example, that it’s not appropriate to focus on core measures of inflation, which exclude volatile food and energy prices. 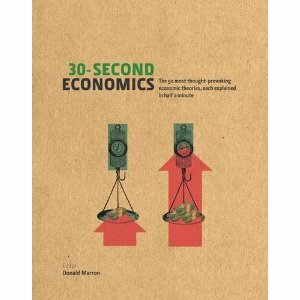 Others argue that the government systematically (and, perhaps, intentionally) understates inflation. I will leave those old debates to the side today and focus on a third, more contemporary question: Is housing messing up inflation measures? Although the housing bubble popped several years ago, America is still adjusting to its aftermath. Falling house prices don’t directly show up in the CPI, but over time they do result in lower rents and lower estimates of the rental equivalent for owning a home. My question is how big an effect those falling housing prices are having on measured inflation. 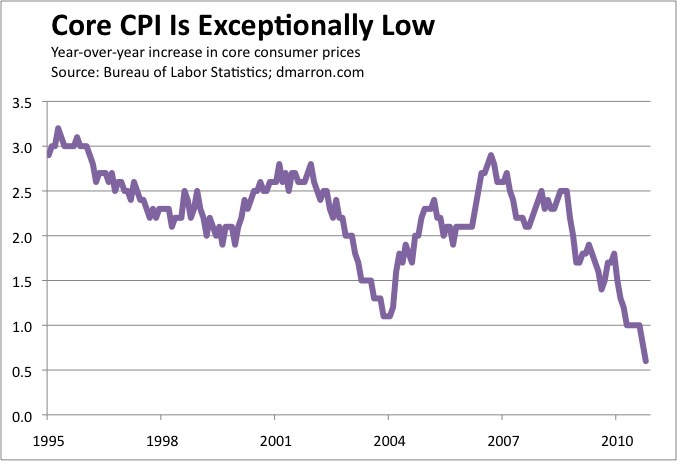 Indeed, core inflation is well below the levels that inspired the previous round of deflation worries back in 2003. 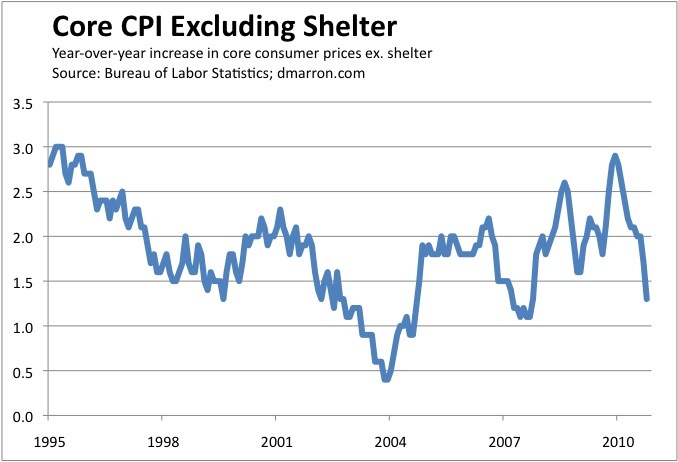 The CPI for shelter has fallen off a cliff. 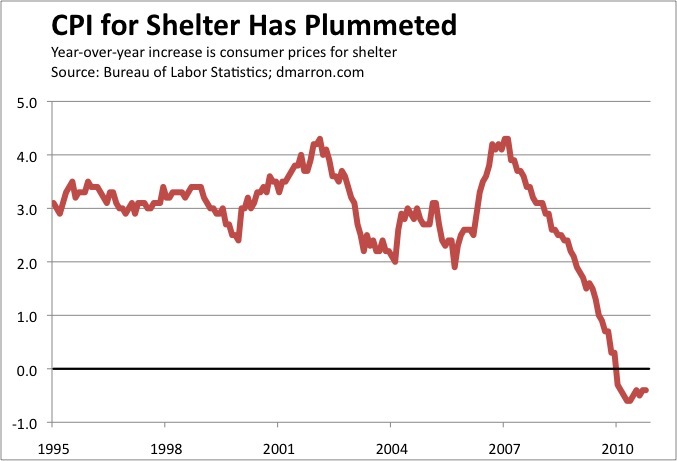 Shelter price inflation averaged about 3% from 1995 through 2007. Over the past year, however, it’s negative. If you strip out shelter from the core CPI, you find that the remaining consumer prices have risen at a moderate pace over the past year (1.3%) – low, but not exceptionally low. Indeed, the economy came much closer to deflation back in 2003, by this measure, than it has so far today. In short, the ongoing weakness in housing is a key reason why measured inflation is so low. But — and this is an important but — inflation still appears quite moderate even when you adjust for this effect. At 1.3% over the past year, the core CPI less shelter certainly doesn’t inspire concern about inflationary pressures. And if you look more recently, you find that this measure of inflation has been falling (e.g., the pace of inflation was about 1% annually over the past six months). Bottom line: Housing weakness has indeed pushed measured inflation down a great deal, but it’s not the only factor at work. Note 1: BLS tracks four costs of shelter: rent of primary residence (for renters), owners’ equivalent rent of residences (for homeowners), lodging away from home, and tenants and household insurance. Lodging and insurance account for only 3.5% of shelter, so it didn’t seem worth the trouble to strip them out to get a housing-only measure. You will sometimes see analysts do this comparison using the BLS measure of housing costs. Housing is about one-third larger than shelter because it includes household energy and utilities purchases, furnishings, and other household operations. For that reason, I think shelter is a better measure for exploring the relationship between the housing market and measured inflation. Note 2: According to BLS, food comprises about 14% of consumer expenditures, energy about 9%, and shelter about 32%. So the core CPI less shelter covers about 45% of consumer expenditures. So use it with care. Indeed, the economy came much closer to deflation back in 2003, by this measure, than it has so far today.